Last Christmas, our blogpost went out on ‘Christmas Eve Eve’ and we wrote an article on alleviating holiday stress. For some, it feels like yesterday since that post, and you’re thinking ‘how could we possibly have arrived at this time of year once again?’ For others, this holiday break has been a long time coming, and we’re crawling towards the finish line and have been dreaming of mince pies since the January blues hit 11 months ago. Either way, as these last few weeks and days approach, most families will be making their journeys across counties, states and even oceans to be together over the holidays, and being with loved ones, sharing gifts, good food and quality time with one another is what it’s all about. All these festivities can leave you with a few “Holiday illnesses” and to help you stay healthy over the season, we’ve put together the causes and symptoms to look out for, and the recommended treatments should you suffer from any of the following conditions. The most effective treatment for Bellyfullaria is to eat less, and increase the ratio of fruit and veg to pudding and meat. However, this is a less popular course of action for many, and the majority of patients choose to lessen symptoms with an indigestion tablet such as Rennie’s, and deal with consequences in January. Santa-vitus most commonly affects those who celebrate Christmas and are ages 3-10. Flare ups are highly aggravated by sugar, decorations, and anything red and white, and early symptoms begin to present as early as October. This condition can be contracted by adults as well, but usually to a slightly lower level. There are few diseases with such specific timings, but it is known that almost all patients will experience the height of this disease on the 25th December, and fortunately most recover very shortly after this day. In the lead up to this climax, however, limiting sugar intake and balancing out with the odd clementine can help relieve dramatic symptoms. Other than that, most parents tend to allow the disease to take its course, as the patient appears to be in minimal pain or suffering. If Santa-vitus is affecting the children, the parents and grandparents usually catch Shuteye Disease. It is caused initially by a lack of sleep in the run up to the holiday break, either due to worrying about presents to be bought or staying up late to prepare food or decorate the house. This condition is in turn exacerbated by the contraction of Santa-vitus in offspring, causing the eyes of the adult to shut as soon as they sit down for a period of 10 or more minutes. Shuteye Disease is, in most cases, a short term condition and will clear up within the first few weeks of January. The best treatment is several nights of uninterrupted sleep for 8-9 hours, however, if this is not possible during the busy holiday times, breathing deeply for 1 minute, counting to 10 slowly, and napping wherever possible, are all effective methods for relieving symptoms temporarily. The exact causes surrounding this mysterious condition are still unknown, despite it being discovered over 1600 years ago, with a significant increase in cases since the 19th century. This global syndrome, in which people suddenly begin singing songs that everyone instinctively knows, changes its repertoire over the decades, although some classics always remain, such as the 1942 ‘White Christmas’ and the 1818 German ‘Silent Night.’ We also know that certain triggers such as snow, religious festivals and the time of year have an influence on the presentation of symptoms. The Monopoly Red Mist is a secondary condition caused by repeated board games and family activities when rivalry, jealousy or competitiveness is also present. Those most at risk are siblings, spouses or other loved ones, symptoms range from mild to dramatic. The most effective treatment for the Monopoly Red Mist is avoidance of board games. If this is not possible, as many patients are first encouraged to ‘join in,’ then deep breathing and repeating the words ‘it is only a game’ are recommended. Removal from the gaming environment may be needed if symptoms are aggravated by playing, especially when playing with family. So remember, this holiday season, especially if there are children in your house, there will be tears, there will be a broken toy or missing batteries, and there will be a few tantrums. But don’t worry. There will also be laughter, great food, and that warm fuzzy feeling when everyone is at home together. 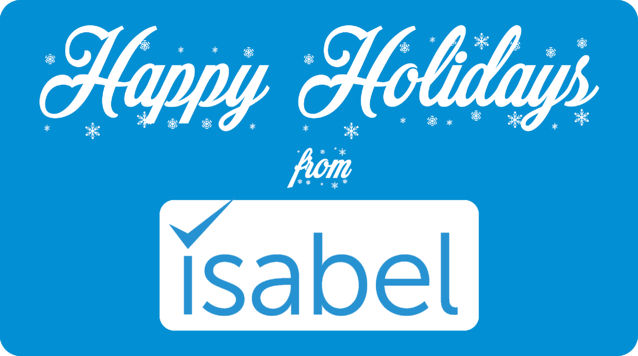 Stay healthy and Happy Holidays for 2016 from all at Isabel Healthcare.